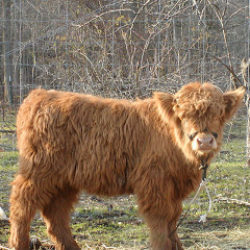 Although most Highlands would be considered a "Mid-Miniature" size breed (Over 43" at 3 years of age) Miniature Highland cattle (under 42" at 3 years of age) are one of the most popular of the miniature breeds of cattle and good miniatures are still quite rare. We started our fold nearly 15 years ago by selecting for extremely thick and long hair, good conformation and udder quality, and a good temperament so that we could handle them easily and they would pass that good temperament on to their calves. Over the years we have worked hard to not only continue to select for these traits, but to reduce the size of our fold by the use of a very small Highland bull. At the same time, we have also accumulated one of the largest Dexter herds in the United States. Although rare now, some Dexters carry a gene called "Chondrodysplasia" which is a dwarf gene. 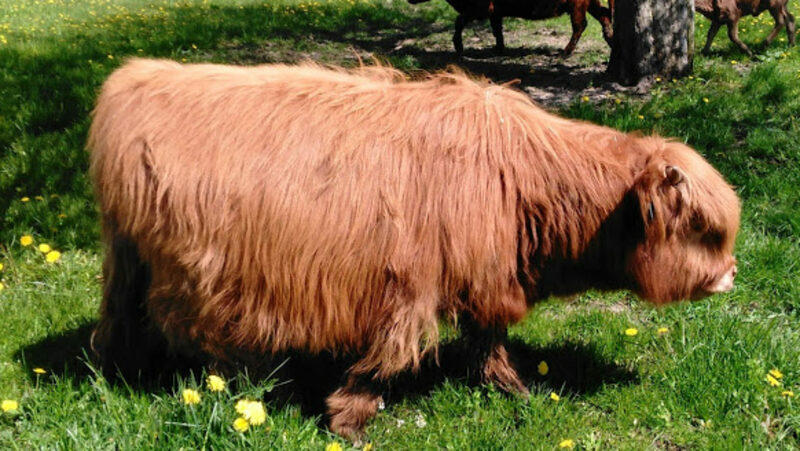 We introduced this gene into the purebred Highlands, and then selected the offspring of these parings and used it again with the purebred Highlands to increase the percentage of Highland traits while retaining the dwarf gene. 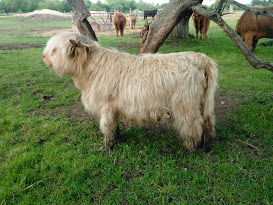 The bull above is the ultimate product of this combination of Dexter and Highland, although there are very few Dexter traits left over from the multiple generations of breeding back to purebred Highlands. This has been a slow process, but the bull is virtually identical to a purebred Highland now, with the exception of the dwarf gene. This bull will never exceed 40", although most Highland bulls will range from 46-60" in height at maturity. Alongside this breeding program, we have been breeding purebred Highlands together in order to reduce the size without the Dexter chondro gene.